Feeling bored? Nepal to the rescue! Posted in Kathmandu, Nepal	by Ms.Z. Monotony – a word without a practical meaning in Nepal. You will never get to use this word to describe life in Nepal. Nepal and monotony simply don’t go hand in hand. In fact, I believe that Nepal should be used as an antonym for monotony. That’s how far apart they are. I have been in Nepal for a bit over two years now, and I can tell you there has not been a boring moment this whole time. I don’t mean that I’ve been having a crazy party-animal time all along. It’s nothing like that – most definitely nothing like that. More than 20 days of bandh. Bandh is not just a regular strike. During bandh, no vehicles are allowed to ply, and the ones that dare are often vandalized. Same goes for the shops. Often times, shops that open get vandalized. This means that people either need to stay at home and use annual leave, or walk to work. Most walk. You would get no vacation days left at all if you use your annual leave each time there is a bandh in Nepal. Kathmandu is not as bad, but in some places in Nepal bandhs can last weeks at a time. The longest one I’ve experienced so far in Kathmandu was 10 days at the time of parliamentary elections. Talk about inconvenience (and exercise)! Constitution has been almost reached and then the deadline extended 2 times. Each of these times involved a large number of protests, bandhs, gas shortages, and other annoying disturbances. SAARC meeting meant closing of the main roads in Kathmandu for several days, and traffic regulation on an odd-even licence plate system. Although, in retrospect, this was kind of nice. Not much traffic, and a very clean city. Constitution promulgation which, the same as no.2, invited a large number of protests, traffic jams and congestion, bandhs and even some violence. Although, it didn’t end there. Months of protesting and political unrest (read: difficulties in finding common language with Indian minority and politicians) have caused one of the largest inconveniences so far. There is no fuel in the country. No fuel means the following: extremely long lines at gas stations (up for a 15-hour wait, anyone? and you only get 10 liters of gas per week); scarce public transport (because everyone is in the gas station line) resulting in overcrowded buses and people treacherously riding on the roofs; no water as the water tankers cannot reach houses without petrol (bye, bye flushing); food supplies in stores running out (and people running to shop and stock up); airlines cutting down on flights as there’s no aviation fuel… and the list goes on and on. It’s crazy how dependent we are on the fuel. One thing affects the other and the other and so on. Currently, Nepal is a perfect example of what the world will look like when it runs out of oil. Although the world will probably be a lot more chaotic than this. Nepalis are so cool about the whole situation. Me – not so much. If you ever wondered what it feels like to live an adventurous life on the other side of the world, do consider coming to Nepal. It will not disappoint. I cannot promise you will find spirituality and inner peace, though. You’re more likely to discover ulcers. « Oye, you over there, snap that wire! Ms. Z, I’ve been religiously following your website for a while now and today, I feel compelled to write this. I’ve lived in Nepal my whole life and admittedly, life here can get frustrating at times thanks to bandhas,strikes and what not. 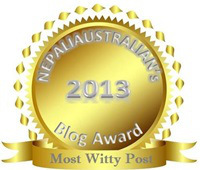 What is refreshing about your blog is that you provide a fresh and optimistic approach to life in Nepal. I don’t know what it is but your words make me feel lighter. You’re happy and that’s what matters. Thank you so much for you optimism. © The Roofs Of Kathmandu, 2014. Unauthorized use and/or duplication of this material without express and written permission from this blog’s author is strictly prohibited. Excerpts and links may be used, provided that full and clear credit is given to The Roofs Of Kathmandu with appropriate and specific direction to the original content. Creating A Sustainable Future Through Awareness, Education and Action!